No stone left unturned or indeed no bier left undrunk in team Ireland’s pre match preparation. Ireland Old Boys 5, Inter Zurich 5. The day started eventfully with David Hume redecorating himself and the floor of the dining room with natural yoghurt! Something to do with hooking a spoon apparently??!! With the curling not starting until 3 o’clock there was plenty of time to explore – and the intrepid group started out an exciting adventure to downtown Garmisch. 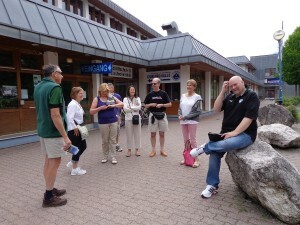 This is a lovely Bavarian town surrounded by mountains – which we couldn’t see as they were shrouded in clouds! 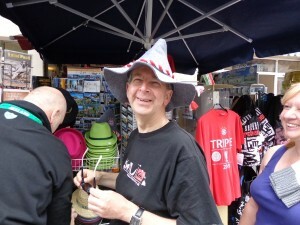 There was much amusement as a couple of the boys tried on some traditional headwear in advance of the Bavarian Night on Saturday. Hats are more likely than lederhosen it has to be said! DW made a well predicted beeline for the Tourist Information Centre as he is apparently guaranteed to do and came away armed with all sorts of info and armfuls of brochures most of which were written in Russian. Ah well………. After our heroes had gorged themselves on a lunch of large cheese sandwiches washed down with lashings of ginger beer(!) in preparation for the battle to come, it was off to the ice rink………. 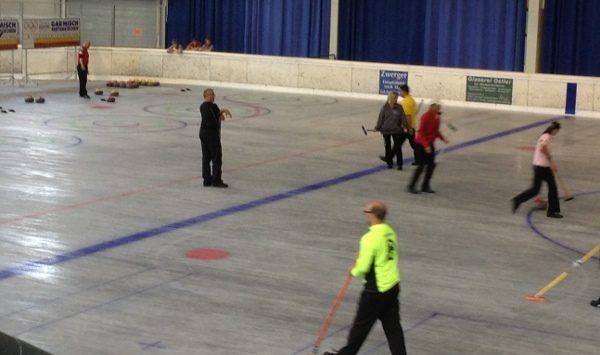 The curling experience was mixed to be honest. The ice pad is grey and dull with thousands of lines for different ice sports and the house was just painted lines on the pad so really difficult to see. The team -JJ, BG, DW & DH (TT still recovering from his military fitness training from earlier in the week) started well enough with a 2 in the first end but showed a certain amount of ring-rustiness and didn’t manage to pull away from their Swiss opponents. JJ elected to hit to give up a single in the 7th while lying 2 against to go down the 8th peels with the hammer. The Swiss skip played a near freeze with her last stone and the Big Man went for a half stone takeout to ensure we didn’t lose the end. Unfortunately the shooter just rolled out of the house leaving a blank end so result was 5-5 with 3 ends apiece. We attended a sparkling wine reception at the local casino and as it happened one of the ladies dispensing the drink was American with an Irish Grannie whose history she had been trying to trace for years. We of course had to discuss this with her so we kept her entertained with craic while she ferried bottles to our table with alarming regularity!!! This curling touring is pretty tough! Next game is 12.30 tomorrow with TT coming in for DH (who is going to join another team of three players to help out for one game). There is also a Segway tour planned for tomorrow so we may be down on numbers ourselves after that!!! Julian starts to wonder why the hell he agreed to bring this bunch so far from home! !